Barbara is a 19-year-old college student living in the dormitory. In January, she came down with a sore throat, headache, mild fever, chills, and a violent but unproductive (i.e., no mucus) cough. To treat these symptoms, Barbara began taking an over-the-counter cold medication, which did not seem to work. In fact, over the next few days, while some of Barbara’s symptoms began to resolve, her cough and fever persisted, and she felt very tired and weak. What types of respiratory disease may be responsible? Humans have been asking for millennia: Where does new life come from? Religion, philosophy, and science have all wrestled with this question. One of the oldest explanations was the theory of spontaneous generation, which can be traced back to the ancient Greeks and was widely accepted through the Middle Ages. This theory persisted into the 17th century, when scientists undertook additional experimentation to support or disprove it. By this time, the proponents of the theory cited how frogs simply seem to appear along the muddy banks of the Nile River in Egypt during the annual flooding. Others observed that mice simply appeared among grain stored in barns with thatched roofs. When the roof leaked and the grain molded, mice appeared. 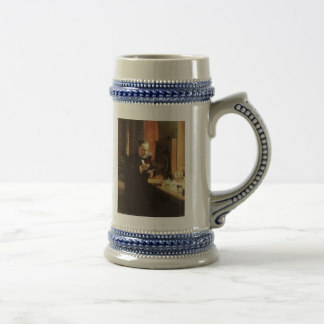 Jan Baptista van Helmont, a 17th century Flemish scientist, proposed that mice could arise from rags and wheat kernels left in an open container for 3 weeks. In reality, such habitats provided ideal food sources and shelter for mouse populations to flourish. However, one of van Helmont’s contemporaries, Italian physician Francesco Redi (1626–1697), performed an experiment in 1668 that was one of the first to refute the idea that maggots (the larvae of flies) spontaneously generate on meat left out in the open air. He predicted that preventing flies from having direct contact with the meat would also prevent the appearance of maggots. Redi left meat in each of six containers (Figure). Two were open to the air, two were covered with gauze, and two were tightly sealed. 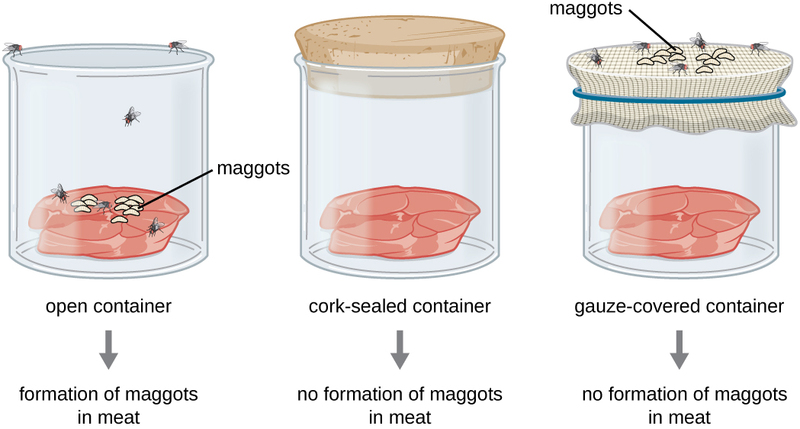 His hypothesis was supported when maggots developed in the uncovered jars, but no maggots appeared in either the gauze-covered or the tightly sealed jars. He concluded that maggots could only form when flies were allowed to lay eggs in the meat, and that the maggots were the offspring of flies, not the product of spontaneous generation. Francesco Redi’s experimental setup consisted of an open container, a container sealed with a cork top, and a container covered in mesh that let in air but not flies. Maggots only appeared on the meat in the open container. However, maggots were also found on the gauze of the gauze-covered container. In 1745, John Needham (1713–1781) published a report of his own experiments, in which he briefly boiled broth infused with plant or animal matter, hoping to kill all preexisting microbes.2 He then sealed the flasks. After a few days, Needham observed that the broth had become cloudy and a single drop contained numerous microscopic creatures. He argued that the new microbes must have arisen spontaneously. In reality, however, he likely did not boil the broth enough to kill all preexisting microbes. Lazzaro Spallanzani (1729–1799) did not agree with Needham’s conclusions, however, and performed hundreds of carefully executed experiments using heated broth.3 As in Needham’s experiment, broth in sealed jars and unsealed jars was infused with plant and animal matter. Spallanzani’s results contradicted the findings of Needham: Heated but sealed flasks remained clear, without any signs of spontaneous growth, unless the flasks were subsequently opened to the air. This suggested that microbes were introduced into these flasks from the air. In response to Spallanzani’s findings, Needham argued that life originates from a “life force” that was destroyed during Spallanzani’s extended boiling. Any subsequent sealing of the flasks then prevented new life force from entering and causing spontaneous generation (Figure). (a) Francesco Redi, who demonstrated that maggots were the offspring of flies, not products of spontaneous generation. (b) John Needham, who argued that microbes arose spontaneously in broth from a “life force.” (c) Lazzaro Spallanzani, whose experiments with broth aimed to disprove those of Needham. Describe the theory of spontaneous generation and some of the arguments used to support it. Explain how the experiments of Redi and Spallanzani challenged the theory of spontaneous generation. 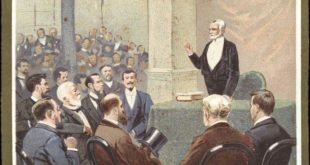 The debate over spontaneous generation continued well into the 19th century, with scientists serving as proponents of both sides. To settle the debate, the Paris Academy of Sciences offered a prize for resolution of the problem. Louis Pasteur, a prominent French chemist who had been studying microbial fermentation and the causes of wine spoilage, accepted the challenge. In 1858, Pasteur filtered air through a gun-cotton filter and, upon microscopic examination of the cotton, found it full of microorganisms, suggesting that the exposure of a broth to air was not introducing a “life force” to the broth but rather airborne microorganisms. Later, Pasteur made a series of flasks with long, twisted necks (“swan-neck” flasks), in which he boiled broth to sterilize it (Figure). His design allowed air inside the flasks to be exchanged with air from the outside, but prevented the introduction of any airborne microorganisms, which would get caught in the twists and bends of the flasks’ necks. If a life force besides the airborne microorganisms were responsible for microbial growth within the sterilized flasks, it would have access to the broth, whereas the microorganisms would not. He correctly predicted that sterilized broth in his swan-neck flasks would remain sterile as long as the swan necks remained intact. However, should the necks be broken, microorganisms would be introduced, contaminating the flasks and allowing microbial growth within the broth. 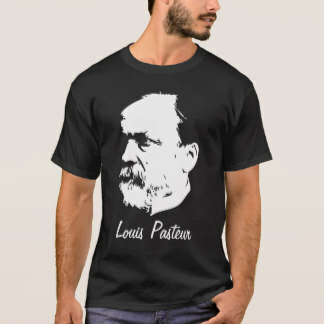 Pasteur’s set of experiments irrefutably disproved the theory of spontaneous generation and earned him the prestigious Alhumbert Prize from the Paris Academy of Sciences in 1862. In a subsequent lecture in 1864, Pasteur articulated “Omne vivum ex vivo” (“Life only comes from life”). In this lecture, Pasteur recounted his famous swan-neck flask experiment, stating that “…life is a germ and a germ is life. Never will the doctrine of spontaneous generation recover from the mortal blow of this simple experiment.”4 To Pasteur’s credit, it never has. How did Pasteur’s experimental design allow air, but not microbes, to enter, and why was this important? What was the control group in Pasteur’s experiment and what did it show? The theory of spontaneous generation states that life arose from nonliving matter. It was a long-held belief dating back to Aristotle and the ancient Greeks. 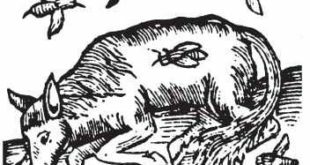 Experimentation by Francesco Redi in the 17th century presented the first significant evidence refuting spontaneous generation by showing that flies must have access to meat for maggots to develop on the meat. Prominent scientists designed experiments and argued both in support of (John Needham) and against (Lazzaro Spallanzani) spontaneous generation. Which of the following individuals argued in favor of the theory of spontaneous generation? Which of the following individuals is credited for definitively refuting the theory of spontaneous generation using broth in swan-neck flask? Which of the following experimented with raw meat, maggots, and flies in an attempt to disprove the theory of spontaneous generation. The assertion that “life only comes from life” was stated by Louis Pasteur in regard to his experiments that definitively refuted the theory of ___________. Exposure to air is necessary for microbial growth. 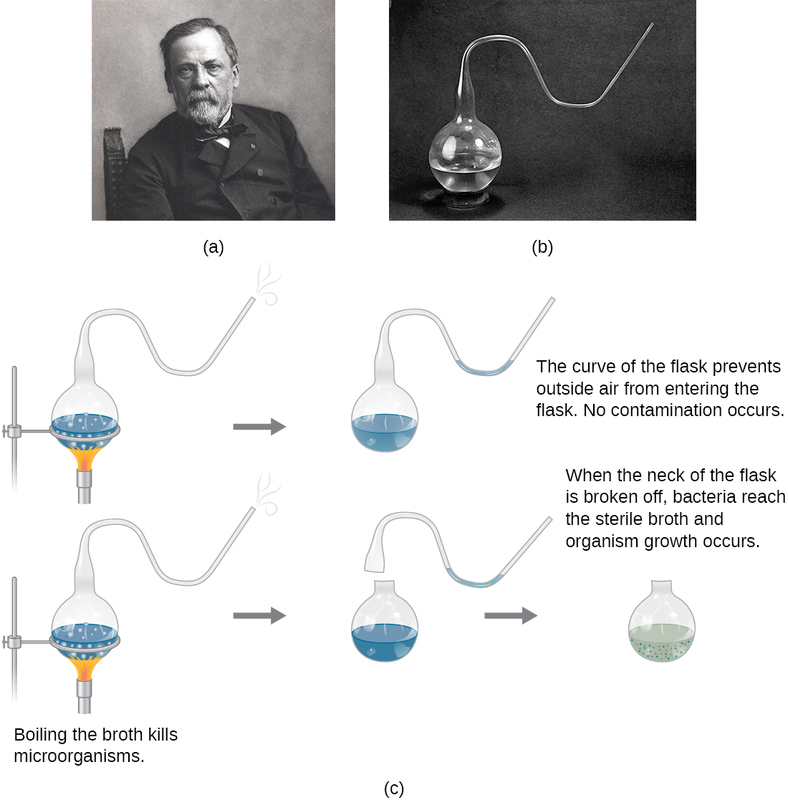 Explain in your own words Pasteur’s swan-neck flask experiment. Explain why the experiments of Needham and Spallanzani yielded in different results even though they used similar methodologies. What would the results of Pasteur’s swan-neck flask experiment have looked like if they supported the theory of spontaneous generation? 2 E. Capanna. “Lazzaro Spallanzani: At the Roots of Modern Biology.” Journal of Experimental Zoology 285 no. 3 (1999):178–196. 3 R. Mancini, M. Nigro, G. Ippolito. 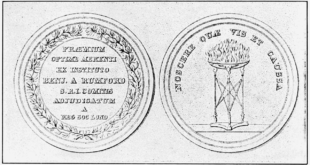 “Lazzaro Spallanzani and His Refutation of the Theory of Spontaneous Generation.” Le Infezioni in Medicina 15 no. 3 (2007):199–206. 4 R. Vallery-Radot. The Life of Pasteur, trans. R.L. Devonshire. New York: McClure, Phillips and Co, 1902, 1:142.